Drawesome is a freelance illustration and design business created by me, Laura Elliott. I use Drawesome as a platform to playfully & intelligently explore my whimsical perspective on the world. Having been through art education (Weston College and University College Falmouth), I was released into the world as a freelance illustrator to spread art and joy to the world. I currently reside in Bristol, UK. 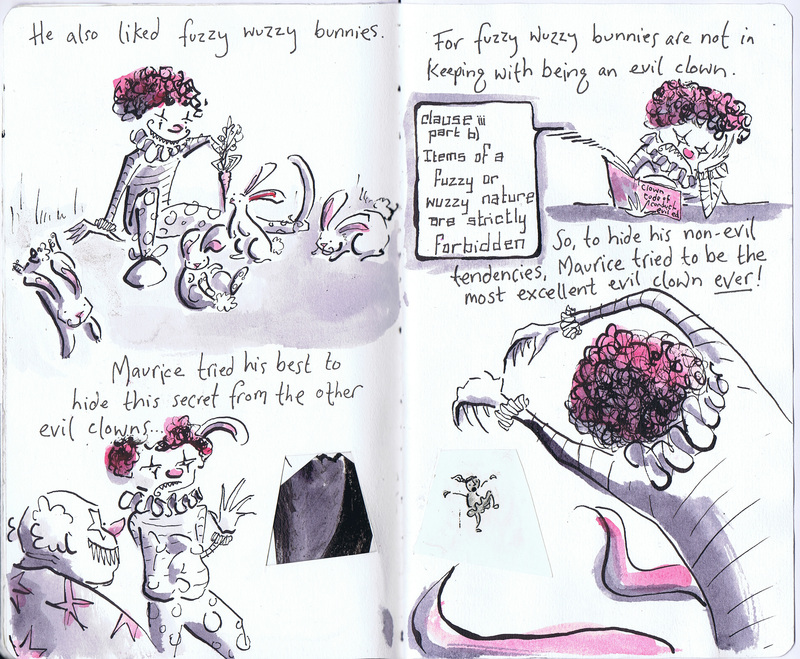 Exerpt from Nighttime Stories – part of The Sketchbook Project. I love finding ways to be expressive – which is how I discovered a penchant for making origami flowers and my killer skills drawing with an etch-a-sketch. I particularly enjoy making illustrated journals (one of which got featured in The New York Magazine). I also believe in the importance of happiness and its knock on effect; and have implemented many happiness-inducing projects. I enjoy making new discoveries, which is one of the reasons why I went backpacking around central Europe on my own; and why I’m a self-confessed culture vulture in my home of Bristol. Photo of Machete Rose performing ‘Elf and Safety’ burlesque routine. I’m passionate about dancing; most of my experience is in salsa, burlesque and synchronised swimming, I’ve been privileged to perform, compete, and teach dance. As an artist and performer I know the importance of presentation, down to every last sentence, ink splash or sequin. My burlesque alter ego is Machete Rose – she’s the love child of Quentin Tarantino and Tim Burton. I love bears and lions – mostly because they roar and have claws. A fez makes everything better. EVERYTHING. Thanks! I’m glad you stopped by for a look and that you like it!